It’s important to find ways to secure all the important information within the walls of your business. Fortunately, there are some tips that will help you with this if you’re willing to take steps to carry them out. Make sure you never throw away old computers or copy machines before completely erasing their hard drive. These devices are a gold mine for identity and data thieves to gain easy entry. Don’t overlook your smartphone. This is a storehouse of personal information, some of which is probably company related. While it’s convenient to have this information by you, they do carry business security risks with them. Having a strong password policy can be an inconvenience, but it’s nowhere near as inconvenient as a data breach. So, take the time to create a strong password then make sure you keep it safe. While there’s a lot of attention paid to high-tech threats, you shouldn’t forget how valuable your metal keys are. Your locksmith reminds you that there are lots of doors that open things like file and server rooms, even your company’s entire inventory with the simple twist of a key. This is a big business security risk because you won’t even know who unlocked the door and got away with your merchandise or company secrets. A deadbolt is a physical security standard for protecting your company’s exterior doors. When it’s properly installed, it’ll guard your doors against an attack from even the most determined intruder. Going beyond the deadbolt, you should also install a modern security system. Composed of an array of electronic components, it’s designed to sense, decide, and act upon any intrusion. The security system senses events, decides if they’re a threat, then acts on it. Typically, they’ll also employ the use of security cameras to help with both investigation and deterrence. The images your security cameras collect are used to review crimes and accidents so you know what really happened. These cameras also have a deterrent value since people usually behave better when they know they’re being watched. 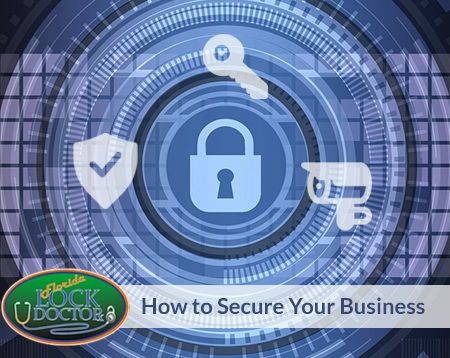 You also have to monitor unauthorized and unescorted visitors as they can not only pose a physical threat, but they can also pose a threat to your business security. This is why you want to make sure you have a controlled entry point, escorts in place, badges for visitors to wear, and sign in/out sheets to use. When your business occupies more than a single floor you’ll want to have floor marshals on each floor. Make sure this policy is clearly communicated to everyone who works for you so they’ll feel more comfortable approaching or reporting a suspicious individual. Call on us at the Florida Lock Doctor to help you with any of your needs. We understand the importance of business security as we’ve helped many businesses with it over the years. We look forward to helping you next.